There is a very new book that I think is wonderful, it's The Secrets of Planning and Designing Hand-Hooked Rugs, by Deanne Fitzpatrick with Susan Huxley, presented by Rug Hooking Magazine. This is one of those wonderful books that you can carry around with you and read a bit here and a bit there and have good things to think about all day. Deanne offers advice, suggestions, and exciting instructions in the same warm manner that she does in real life - I hear her voice all the way through the book. I have been hooking a crow rug ever since my trip last summer to Nova Scotia where I took a class from Deanne at the ATHA Biennial - I saw crows on both sides of the highway all across Canada, from Windsor, Ontario to Halifax, Nova Scotia. Since I was driving alone, they became companions on my adventure. I mentioned the crows in Deanne's class and she quoted an old rhyme her father used to say when they'd go out for a drive when she was a child - I thought about that rhyme while I was drawing my rug, but I couldn't remember it, and now I have found it in Deanne's book! If you have any thought about designing your own rugs, this is the book to get. It's quite new and readily available, so I don't want to ruin your pleasure by telling too much before you get your own copy, but I do want to say you will be charmed into drawing your own design(s) and loving yourself and your talent as you do it. It's the kind of book you will want to keep with you for a long time - you can't just flip through it, or even read it from cover to cover, and then put it away. 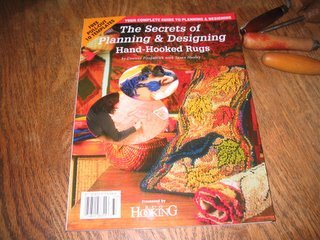 I have this book and highly recommend it - it is about design - as I am a painter trying my hand at rug-hooking I found it brought back some lessons I learned long ago and some I do without thinking, some I had forgotten. Anyone who is designing her own patterns should read this book.